Daily Illuminator: You Want How Much For Fury Of Dracula? January 18, 2015: You Want How Much For Fury Of Dracula? "This is Scotland Yard with something actually happening between the turns where Mister X reveals himself. This is Scotland Yard with rats, thieves, assassins, wolves, bats, stormy weather, wild horses, hired scouts and all sorts of flavorful Gothic stuff." None of this is at all a bad thing . 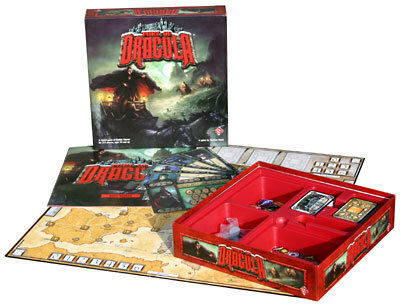 . . but there is one very bad thing about Fury of Dracula these days: It's terribly expensive! At some point when I wasn't watching the game went out of print, and it is such a fantastic game that the price has continued to climb. I hope Fantasy Flight Games reprints this very soon; $200 to $300 is way too much for the game, even as awesome as it is! I'm happy that I picked up my copy about seven or eight years ago.